To make the rice, bring water to boil. While it is getting ready to boil, rinse uncooked rice until water becomes clear and strain. Add rice to boiling water and turn heat to low. Steam for 15 minutes. Cover the bamboo mat with plastic wrap, to keep the rice from sticking to it. To make the “su” or vinegar mixture: Mix together the rice vinegar, sugar, and salt in a nonreactive saucepan and cook at low heat until salt and sugar have dissolved. Fold a piece of the nori to fit the size of the mat. Dip your fingers in the vinegar mixture and gently spread the rice to the edges of the mat in an even layer. Keep wetting your fingers so they don’t stick to the rice, press lightly on the rice or it will get soft and mushy. Sprinkle rice with sesame seeds, then turn the nori with the rice on it over so that the rice is on the bottom and the nori is facing upward. At the bottom edge of the nori line up several strips of cucumber, then avocado. Add crab sticks along the edge of the avocado. Roll bamboo mat over the filling, lifting the rice over the filling, and roll until the rice meets the nori. Begin to peel bamboo mat away as you roll, so you don’t roll the mat into the California roll. When rice is completely rolled up, give the mat a squeeze so that rice sticks together well. 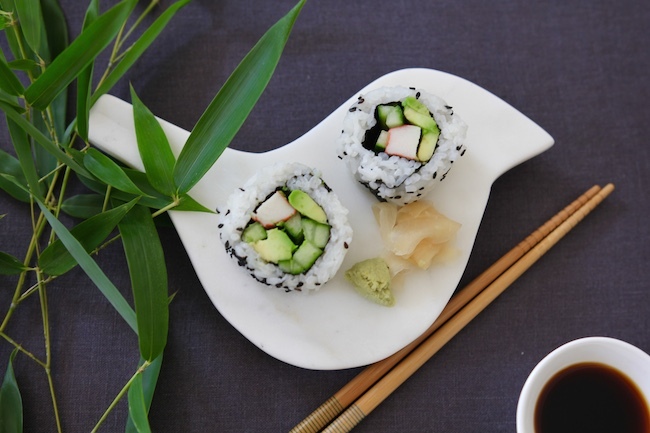 Carefully slice roll into one-inch thick pieces, to make 6 pieces of sushi. Mix wasabi powder with a bit of water to make a paste. 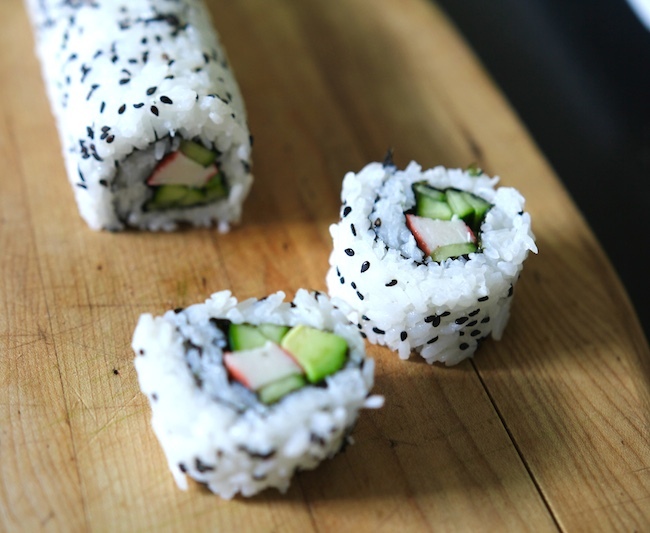 Serve sushi with wasabi and soy sauce.